Chip is on a roll. He has really been working on getting some new inventory produced before the summer shows and one of the things he is realizing is that there is a much bigger market for his briefcases than he expected – so he put together this one last week which I am very excited to show you. 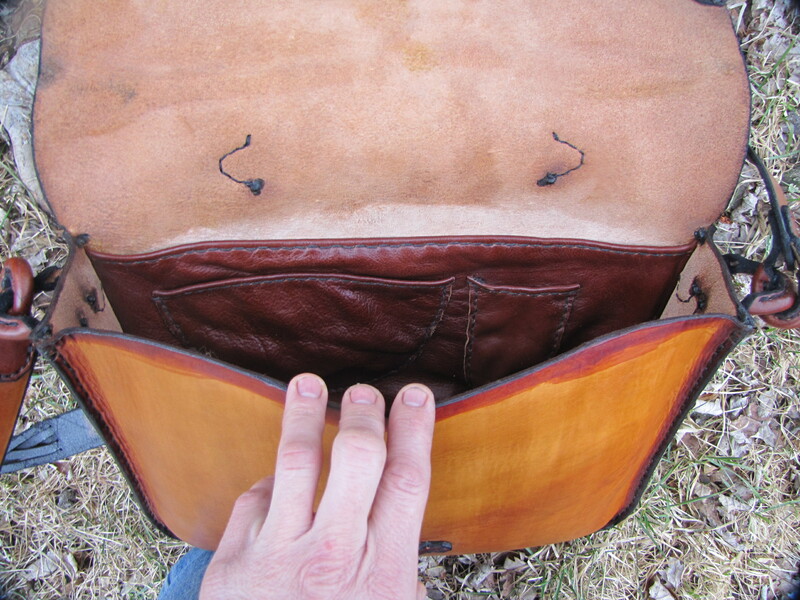 This briefcase is 15 inches wide, 11 inches high and around 4 inches deep (due to the wet molded body of the bag). 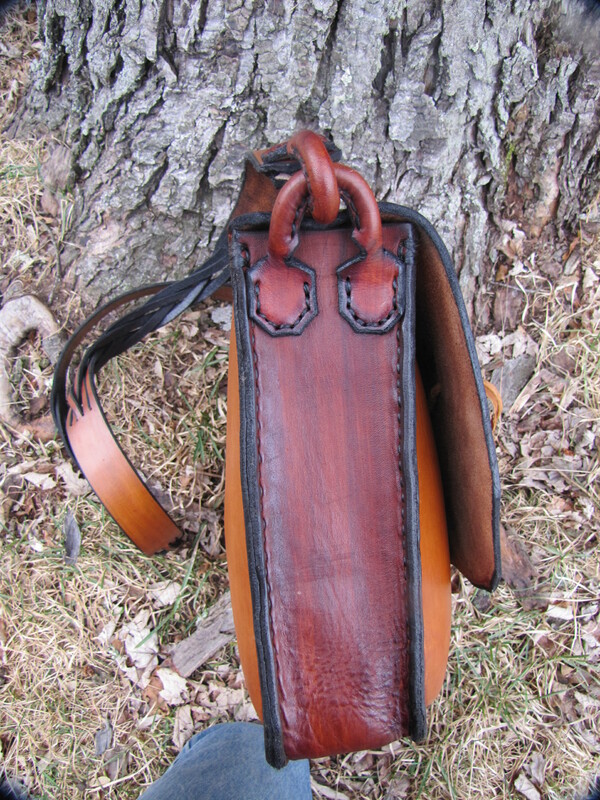 Because this bag is designed to carry more weight than a smaller field bag, it has both a strap and a handle on the top. 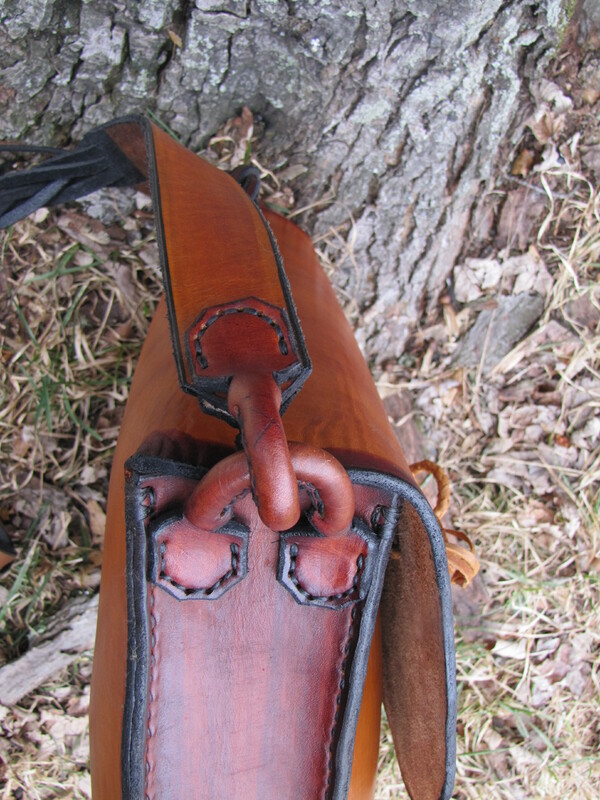 This handle uses the mystery braid in its construction. 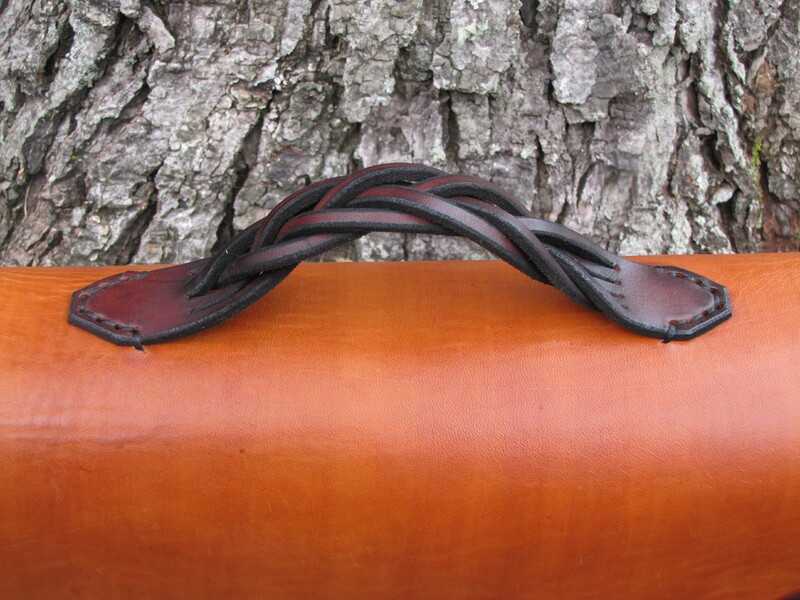 The strap is a double mystery braid strap with a solid 6 inch section which would obviously sit on one’s shoulder. 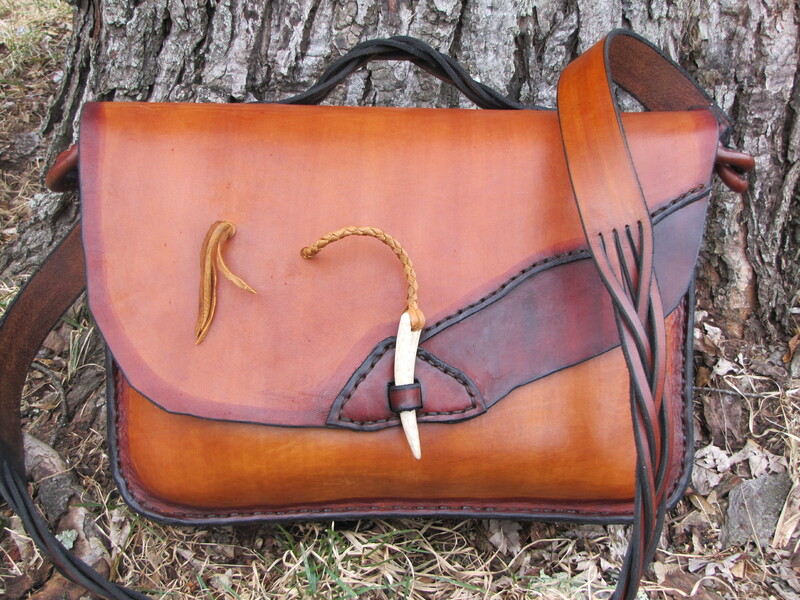 The body of the bag is buckskin dyed with the sides and trim dyed in a medium brown. 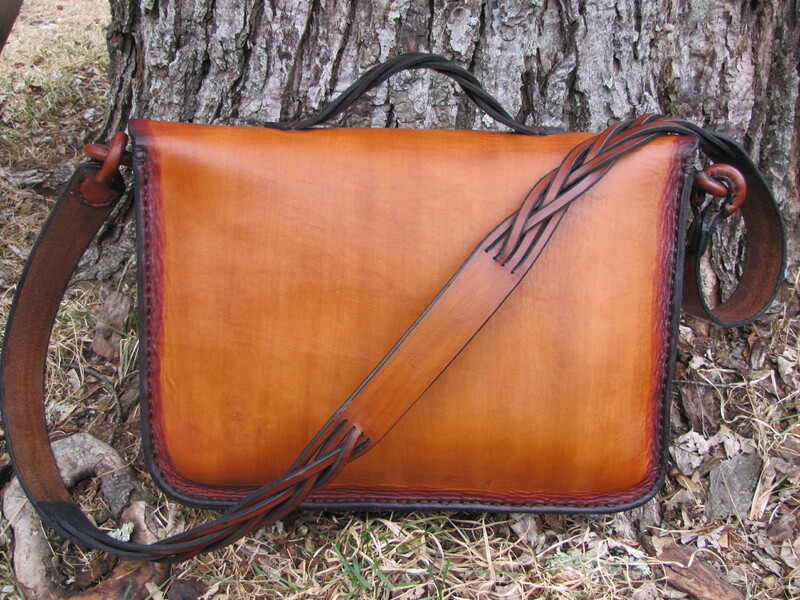 This is a “no metal” design – with stitched leather loop attachment points. It has an inner divider with pockets to hold pens, a small notebook or wallet or mouse. I love this bag. Yes, it looks ALOT like mine, which is probably why I like it and why he made another one because mine gets sooooooo much attention and approval. I hope you like it. He is already working on new bags for next week’s blog. I hope you check back to see them because I truly love showing them off. Now off to the kitchen to work on tomorrow’s post. 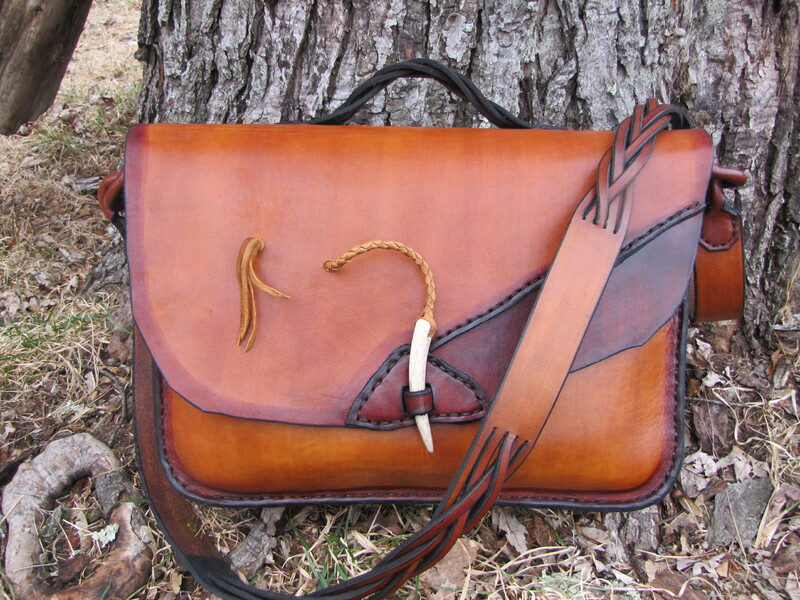 This entry was posted in Chip, Hawk Studio and tagged briefcase, Chip Rosien, hand crafted leatherwork, Hawk Studio, Leather, leather bags, leather briefcase, leatherwork, rough edge briefcase, rustic leather briefcase, rustic leatherwork. Bookmark the permalink. BTW, did you know you have a advertisement at the bottom of your post? No, I did not know – nothing shows up on my page. Could it be your computer adding it? Okay – here is what WordPress has to say about the ads. So apparently some of you (Danielle and Chip so far) got an ad at the bottom of my blog post. Apparently I can’t stop it unless I pay $30/year for a no-ad blog. I have to ponder this for a bit and maybe start working harder on getting the Escape to Evermore webpage up and running. If it gets annoying, please let me know.